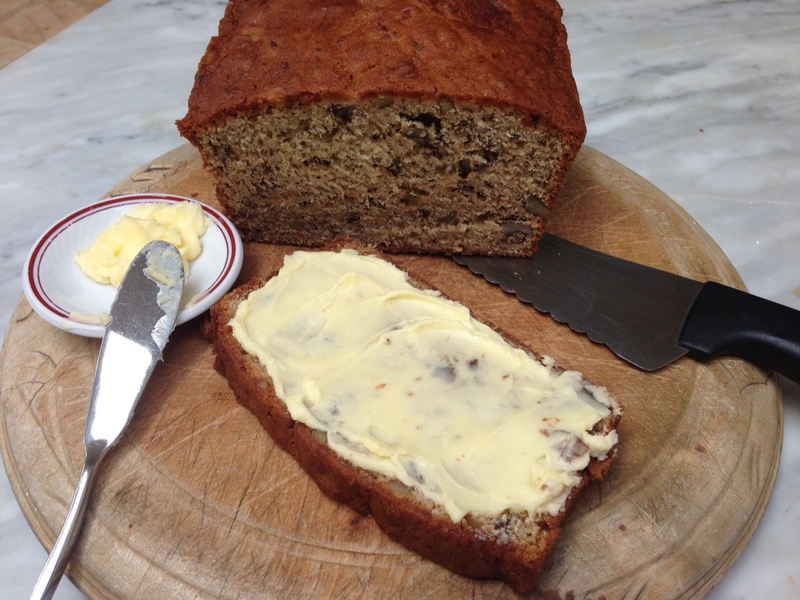 Ripe bananas on the kitchen counter always mean one thing: Banana Bread. It was such a staple of my childhood that I can’t remember a time when my mom wasn’t baking it. I’ve made several attempts at other recipes, making it healthier, “turning it up a notch” with banana chips, added banana flavoring, etc. However, nothing beats this 50+ year old recipe. The smell is my childhood, the taste is sublime. Toast it and top with sweet butter, soft cream cheese or creamy peanut butter or Nutella (if you dare). ahhhhh……. 2. Sift together flour, soda, and salt. Set aside. 3. Mix bananas and water together. Set aside. 4. Beat together shortening and sugar until light and fluffy. Add eggs and vanilla. Beat well. 5. Add dry ingredients alternately with banana mixture to shortening and sugar mixture, mixing well after each addition until smooth. Fold in nuts if desired. 6. Pour into a greased loaf pan and bake for about 1 hr and 15 mins., testing for doneness when a inserted toothpick comes out clean. *Bananas freeze well! Throw them into your freezer (skins on) until you are ready to use. I think that freezing intensifies the flavor. Defrost before using.